Below you will find several help topics. If you can't find the answer you're looking for, please contact . 1) How do I log in? 2) UPDATED - How do I edit my family data (addresses, e-mail addresses, cell #, etc.)? 3) How do I view my child's schedule? 4) How do I view my child's team roster? And how do I see more than the default (public) information, such as addresses, phone #'s, etc? 5) How do I report whether or not my child will be attending a tournament? 6) NEW - What if I'm not receiving CRWA e-mails (e-mails generated by or from within the website by coaches or the computer)?? 1) How does a Coach or Admin log in to Coach or Admin functions? Versus logging in to conduct family related business (updating my personal info, registering my child, reporting my child's attendance, etc)? 2) NEW - How does a Coach or Admin add a practice or tournament to a team's schedule? 3) How should a Coach or Admin send an e-mail to a team, the entire league, or to select individuals in the league? 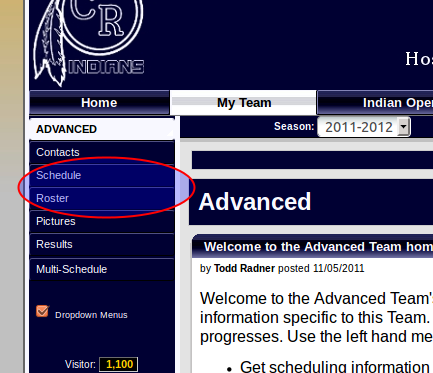 4) How does a Coach or Admin post a message on their team page? And how do you send that same message as an e-mail? 5) How does a Coach or Admin check attendance responses? 6) How does a Coach or Admin send an e-mail to those who have NOT reported attendance? To log in, simply click on Log In on the top right of your screen, or click on Edit My Account on the left side of the screen (see screen shots below). Note: if you are a Coach and/or Admin, these two different log in methods will take you different places, and it is important which one you select (see Coaches help item #1). For parents, it really doesn't matter which one you use to log in, just note in help item #3, that if your going to edit family data (addresses, cell phone #'s, etc), you need to click on Edit My Account afer logging in to get in edit mode. For registration, schedule viewing, reporting attendance, etc, either log in method is fine. If you are new and don't have a password yet, or if you've forgotten your password, simply enter your e-mail, with no password, and your new generated password will be e-mailed to you. Make sure you're entering the e-mail where you receive our correspondence though, if you enter an e-mail not in the database, nothing will be e-mailed to you. 2) How do I edit my family data (addresses, e-mail addresses, cell #, etc.)? First, no matter how you logged in, or where you are in the system, click on Edit My Account on the left of the screen (see below). Once you do this, when you run your mouse pointer over a family member, a line (link) should appear under each person. To edit the personal information for any family member, click directly on their name. Do not click on any icons next to the names, click directly on that person's name. You can update addresses, e-mail addresses, phone #'s, passwords, etc. Make sure to hit Submit at the bottom of the window when done making your changes. 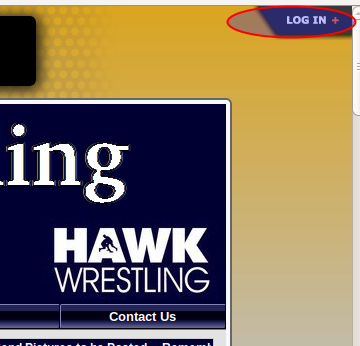 Also note in the below image that in the e-mail field you can enter multiple e-mail addresses, so if you want to receive wrestling related e-mails at home and work, you can put both, just separate them by a comma. Best practices are to edit Dad, enter his e-mail address, edit Mom, enter her e-mail address, and edit your children, and in their e-mail spot, put BOTH Mom and Dad's e-mail address. Remember that you should not be sending e-mail address or phone number updates to Coaches or League Admins. They will query the database for this information, and use what you have in the database. If you would like text message reminders of practices and/or tournaments, make sure you put your cell phone service provider in your database entry for you. If you enter just your cell #, which we would like you to provide, you won't get any text messages. You'll only get text messages if you enter the actual service provider (AT&T, Verizon, T-Mobile, etc.). Note that your child's birthday is NOT an editable field. If you entered the information wrong during registration, or if we entered it wrong when loading your child into the database, please contact . The amount of information you wanted listed on the team Roster (see help item #4) is determined by whether you set this information to Public (visible to all), Roster (visible to teammates only), or Private (not visible). 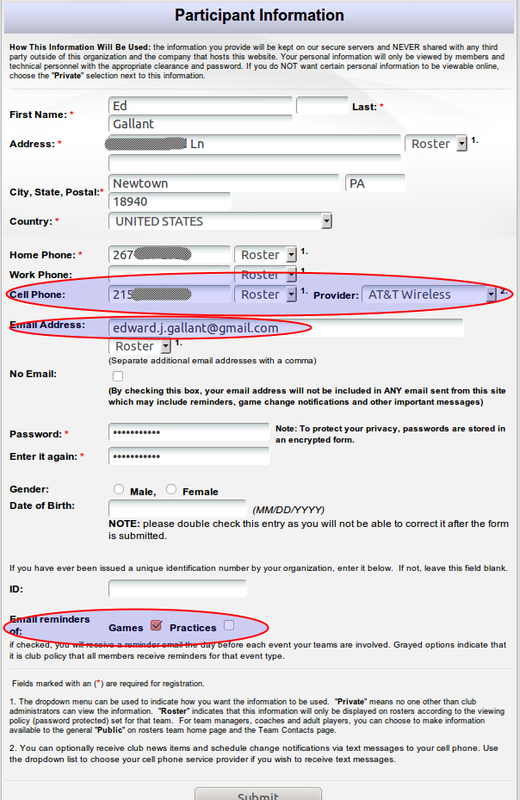 See the two examples below, the first is the recommended child set up (no cell phone, two e-mail addresses listed). The second is a Parent set up (cell # with text message (service provider listed)). Also note, that e-mail reminders of Games (tournaments) have been requested, but Practice reminders have not been requested. Set up your account in whatever manner fits you best. Please note that you can also add a child to your family. Click on the Add Child button. For security reasons, you cannot add a parent. If, at the time of registration, you only supplied info for one parent, and now want to add a second parent, which we prefer, just e-mail and the parent will be added to your account. 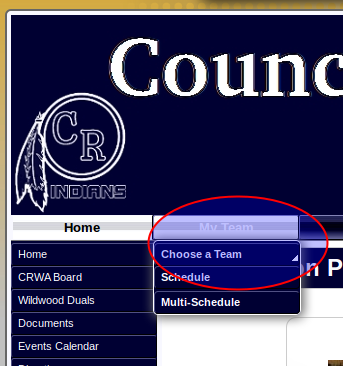 To see your child's schedule, click on My Team. 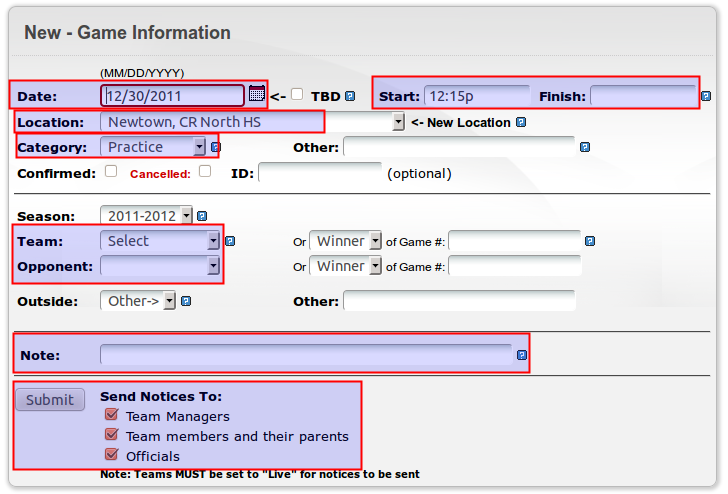 Then select the team your son is on, usually one of Novice, Intermediate, or Advanced. Then, on the left, lick on Schedule. Note that each practice or tournament will have a location listed. Click on that location for directions. Also note that in the upper right there will be several options to link this schedule to your iPhone calendar, your Google (Gmail) calendar, etc. Then, on the left, click on Roster. You'll then see a full roster with as much information as parents have decided they want listed. The amount of information you have listed, and how it is listed, is determined by whether you set this information to Public (visible to all), Roster (visible to teammates only), or Private (not visible) while editing your personal data page (see help item #2). 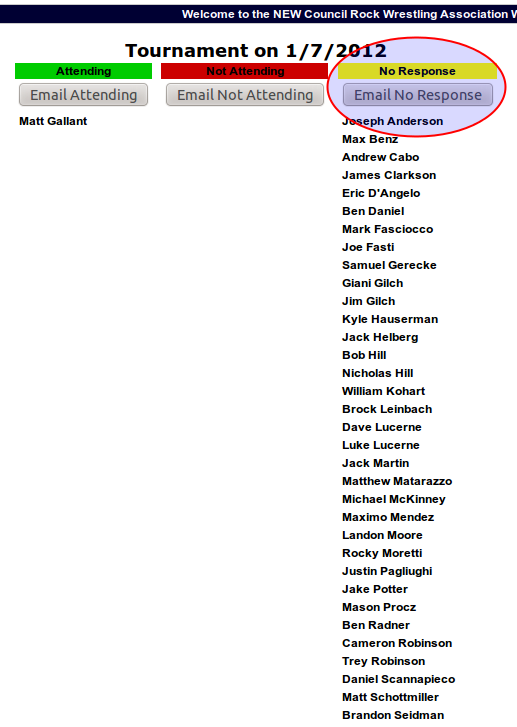 If you click on a Parents name (circled below), you'll see whatever contact information they've provided as well. 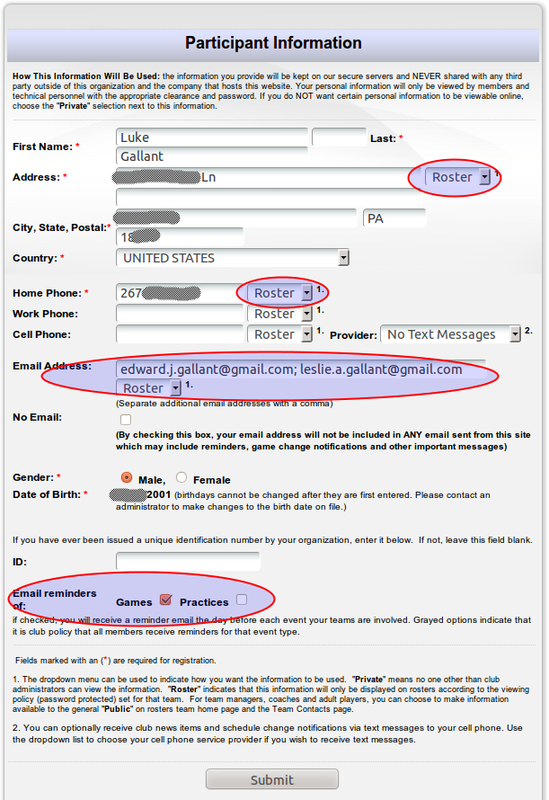 NOTE: the contact info visible on the initial Roster view, once logged into the Roster, is what you provide in your CHILD'S database page (see help item #2). What is seen when you click on a PARENT's name is what that parent entered on their database page. So, you'll probably find additional information by clicking on the parent, as most parents tend to put their cell #, etc, only on their page. You do NOT need to report attendance for practices, or Open Live nights, only items listed as Tournament. 6) What if I'm not receiving CRWA e-mails (e-mails generated by or from within the website by coaches or the computer)?? 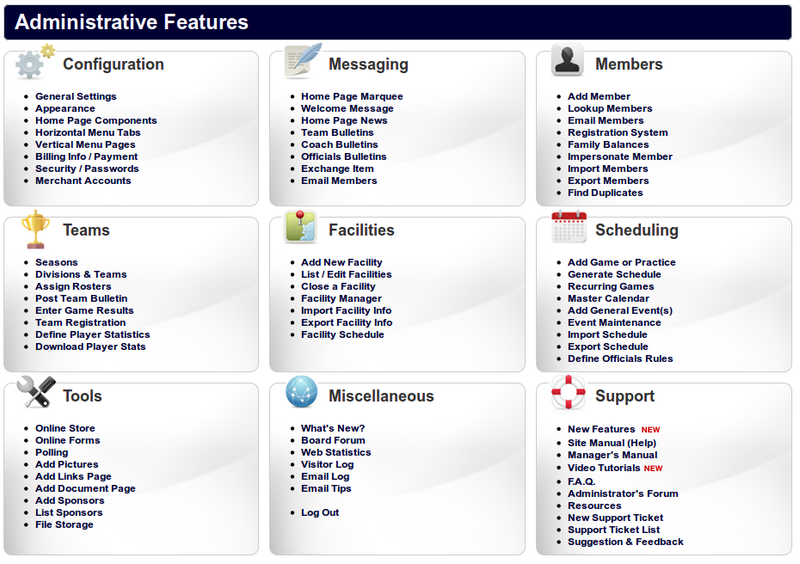 Our website is built using a website league management toolkit from LeagueAthletics.com. LeagueAthletics services are used for online management of thousands of youth sports leagues around the country (including CWRA, CR Newtown Baseball, Middletown A.A, and Lenape Valley baseball locally). This toolkit removes a tremendous administrative burden from league volunteers as it makes parents responsible for their own contact data, and for setting how they want to be contacted (e-mail reminders, text message reminders, no reminders), and for keeping their own data up to date. When you include the online registration abilities (premiering in 2012-2013 for CRWA), it decreases administrative workload even futher. Two things you have to understand about how we will contact you here foward. We no longer know your e-mail or care what it is, or care how often you change it, or care if you want to receive our e-mails at one address or twenty addresses, you handle that by editing your account. We simply create messages from with the website, direct them to a team or teams, and they get automatically sent to every address you provide. 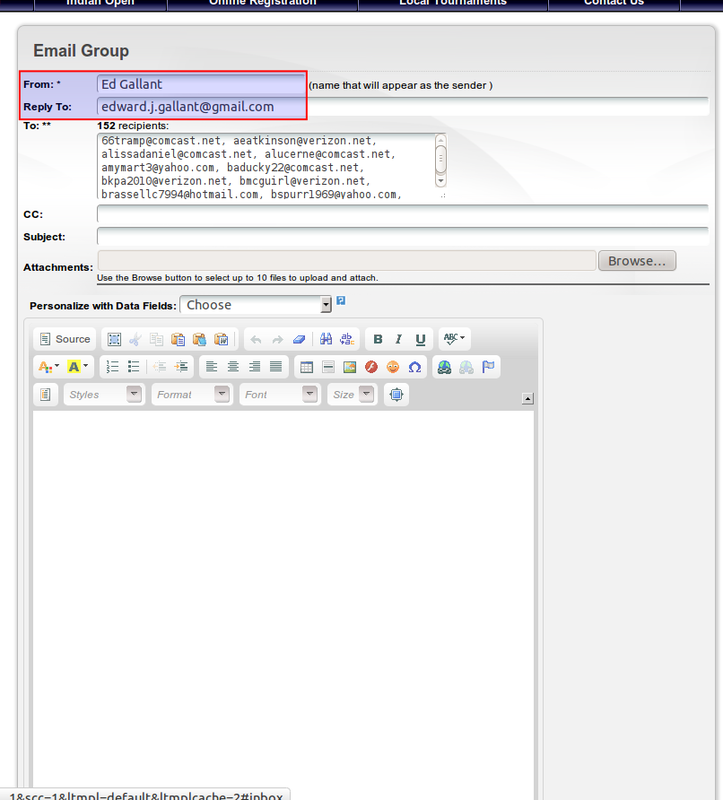 So it is critical that you have your e-mail address typed perfectly (no typos) in your account. Computers are very picky, and if you're not receiving our e-mails, that's the first thing to check - your own account for e-mail address typos. All LeagueAthletics.com websites send their message from a ficticious e-mail address of notification@leagueathletics.com. Because tens of thousands of e-mails are sent a day from this address, many e-mail service providers assume these messages are spam/junk. The easiest way to prevent these messages from going to your spam/junk folder is to add notification@leagueathletics.com to your e-mail address book. Comcast is particularly aggressive in blocking our e-mails and this alone may not solve your problem if you're a Comcast user (see next paragraph). 2) How does a Coach or Admin add a practice or tournament to a team's schedule? The scheduling tool that pops up is very powerful, but fairly straight forward once you've used it once or twice. First set your event Date. Then set a start and end Time. NOTE: times end in "a" or "p", no spaces, and do not use AM or PM. Pick a Location from the drop down list. Many of the venues in the region have been added, but if you need a venue not listed, simply contact . Pick a Category, such as Practice or Tournament, for your event. Now, even though you started this from within a certain team's schedule, you have to set which team this event is for, from the Team list. If this is a joint Practice or Tournament, such as an ICWL touranment where both Advanced and Intermediate attend, enter one team in the Team box, and the other team in Opponent box, then it will be put on the schedule of both teams, so you don't have to repeat this action for the second team. Last, and very important, is Notices. If this is a last minute event addition, and you want parents to be notified immediately, leave all the boxes at the bottom checked and they'll receive an e-mail about the added event. If you are scheduling something for weeks from now, uncheck those boxes, as parents will see this event on the schedule when they review it, or when they get their automated reminder e-mails. 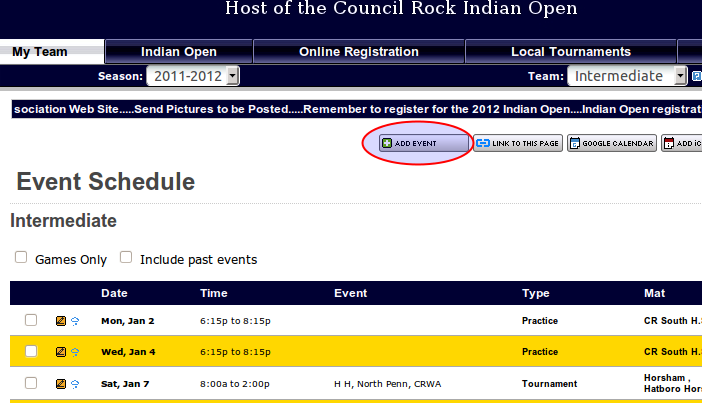 Once done, check the team schedule again to make sure your event showed up as desired. You'll be brought to a screen which allows numerous options to select who you want to e-mail. The easiest, and probably most common usage is to not select anything, and simply hit Find Members at the bottom of the screen. 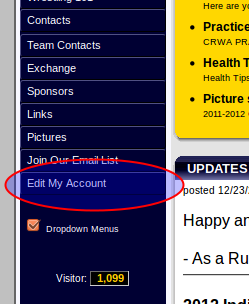 This will e-mail all families in CRWA, including cheerleaders. If you want to e-mail only families of wrestlers, select the Novice, Intermediate, and Advanced teams in the team list (and Middle School if appropriate). 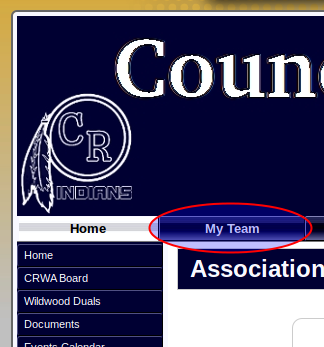 Make sure to hold down the Control key while clicking on multiple teams. There are literally hundreds of combinations of e-mails you could make, such as all Coaches, all 5th graders, all wrestlers over 10 years old, any one with a last name that starts with "G", etc, etc. 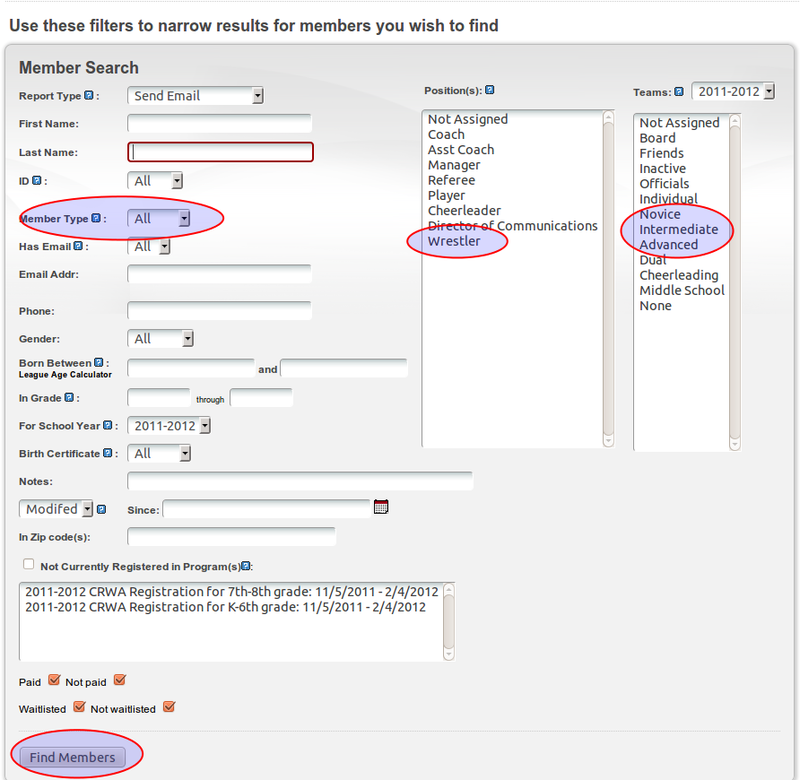 Once you hit Find Members, you'll be brought to an e-mail composition screen that is probably familiar to anyone who sends e-mail. The most important thing is to make sure that you fill out the From and Reply To: fields properly!